Pete Anderson, owner of “Pete’s Floors” has been refinishing and installing wood floors since 1977. Pete first apprenticed with a long time Bay Area hardwood floor company before starting his own business. Some of his projects include restoring floors installed in the 1850’s era, inlaid and parquet floors, borders and feature strips, refinishing stairs and installation of custom mouldings. As a floor mechanic, his work has solid integrity. The beauty of the wood grain, figure and traditional or contemporary color is protected by a preferred finish of conversion varnish. A novel dust control system is utilized. 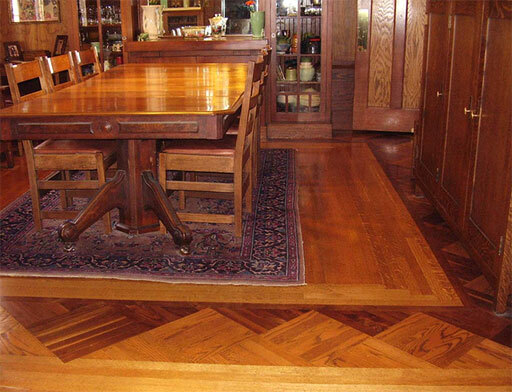 Pete has refinished floors in the Gamble House in Pasadena and the Thorsen House in Berkeley. He has installed a new floor in the maid’s sitting room of the Winchester Mystery House. He has also restored his 1911 craftsman style house in San Jose, CA.